Today the National Sexual Violence Resource Center announced that “Prevention is Possible” will be the theme for Sexual Assault Awareness Month (SAAM) in 2016. The 2016 SAAM campaign will provide community advocates, business and campus leaders, and individuals with a toolkit to promote prevention. These tools will help encourage safe behaviors, thoughtful policies, and healthy relationships. 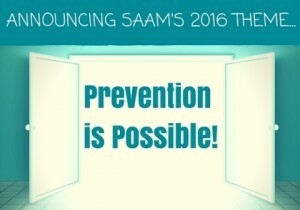 This April’s SAAM campaign will illuminate the way that prevention efforts are a part of a broader societal change. Of course preventing sexual violence (or any form of violence) cannot happen in one month; prevention requires year-round attention and action. Each year there are months dedicated toward ending violence. For example, April is both Sexual Assault Awareness Month and Child Abuse Prevention Month, October is Domestic Violence Awareness Month, January is National Stalking Awareness Month, and February is Teen Dating Violence Awareness Month. These months are opportunities to highlight the ongoing prevention efforts. How are you going to advance prevention in the upcoming awareness months?